Like many readers, I enjoy knowing the “real” story that inspires a novel, especially if historical facts are woven into the plot. Stefanie Pintoff built her career on utilizing history in her novels. Her debut In the Shadow of Gotham introduced New York Police Detective Simon Ziele, who was mourning the loss of his fiancée in the 1904 General Slocum steamship disaster. Ziele teamed up with criminologist Alistair Sinclair to hunt criminals in old Manhattan. Pintoff’s research shows the beginnings of forensics as well as life at the turn of the 20th century. In the Shadow of Gotham won the Edgar Award for Best First Novel by an American Author and was nominated for Agatha, Anthony, and Macavity Awards. 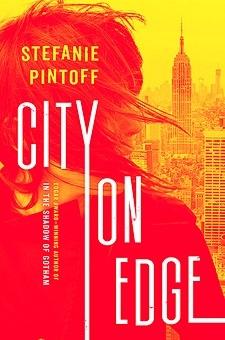 Pintoff’s new series, which began with Hostage Taker and continues with her latest, City on Edge, is set in contemporary times but still honors the past. FBI special agent Evangeline “Eve” Rossi leads her Vidocq team of “ex-cons and barely reformed thugs,” whose nontraditional ways allow them to go where normal detectives can’t. Eve’s team knows how criminals think, because each of them used to be one—which doesn’t hurt, either. Eve’s team is based on Eugène François Vidocq, a French criminal and criminalist during the 19th century. According to books and websites, he turned from being a criminal to become the founder and first director of the crime-detection Sûreté Nationale. He was also the head of the first known private detective agency. Considered to be the father of modern criminology, Vidocq also inspired stories by Victor Hugo, Edgar Allan Poe, and Honoré de Balzac. To add to the authenticity in her novels, Pintoff includes a dossier on each of Eve’s team members.